I found this mummy of a dead caterpillar hanging on a small redbud tree outside our house on February 3rd. I sent the picture to Kevin Firth who responded, "If I had to guess, I would say an American dagger (AD), Acronicta americana. You can still see the remains of the black hair pencils. We went on a hike last fall at Ha Ha Tonka State Park and found several mummified cats on redbud. According to Wagner, the culprit is Aleiodes stigmator, a Braconid wasp." By coincidence we had found two white A. americana caterpillars on the underside of leaves on the same redbud tree back in 2014. I prepared a blog but never posted it so here it is. 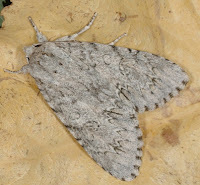 The American dagger like other owlet moths is relatively drab unless you focus closely on the wavy lines and black dots that form a distinctive if subtle pattern. 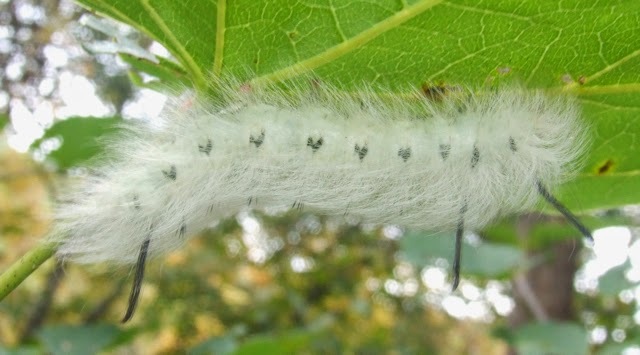 The larvae on the other hand are covered with fine yellow setae (hairs) that may turn white with age. 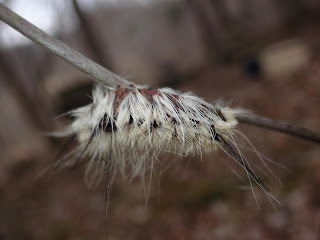 There are thicker black tufts of setae on the first and third segments. The fuzziness invites petting, BUT DON'T. The AD is one of several caterpillar species which are covered by venomous hairs that can penetrate the skin and break off, causing a burning/itching sensation described by Kevin in this blog last year. 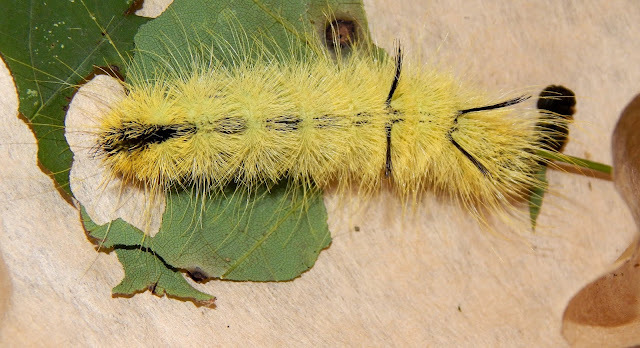 These AD larvae feed on the leaves of a variety of popular neighborhood trees like oak, ash, elm, redbud, willow and maple and then crawl onto the ground to pupate so they commonly are found by children. A good rule to teach kids about hairy caterpillars is "look it up before you pick it up." 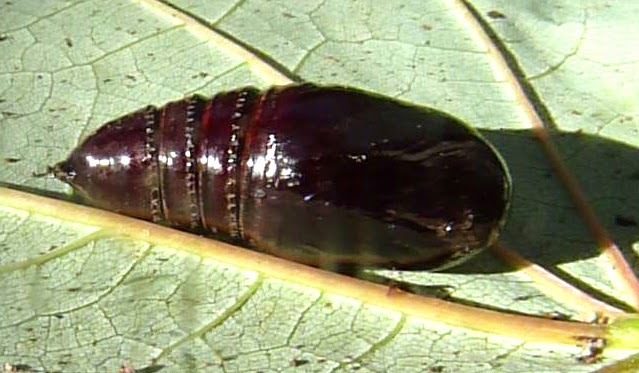 I raised the 2014 larvae above on redbud leaves and they pupated a week later. 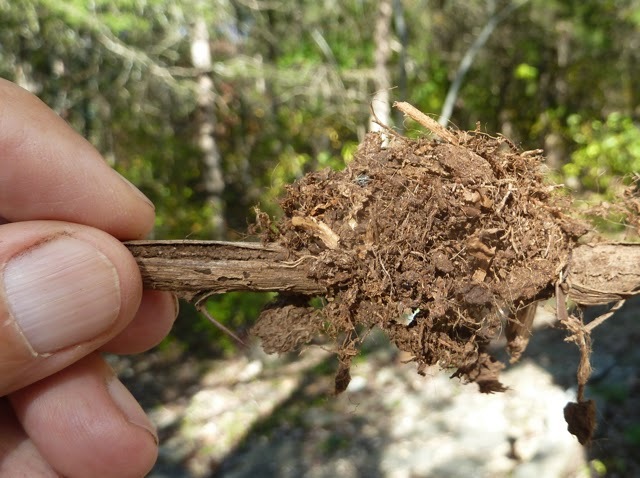 The American dagger usually forms a dense silk cocoon by burrowing into wood and may combine soft rotting wood into a silken cocoon, so I put some old sticks in with the sphagnum moss in their box. One produced the standard cocoon while the other one was covered with dried moss and twigs. As I was gently transferring a cocoon in the palm of my hand it to its winter home, I felt it move slightly. I had seen this in a Luna moth pupa so I laid it on a leaf and gently pressed on its tummy and recorded this video. What was particularly fascinating about the dead caterpillar above was its mummy, retaining its color, shape and structure in death. Most parasitized caterpillars simply turn to goo. This is the subject of the next blog so stay tuned!